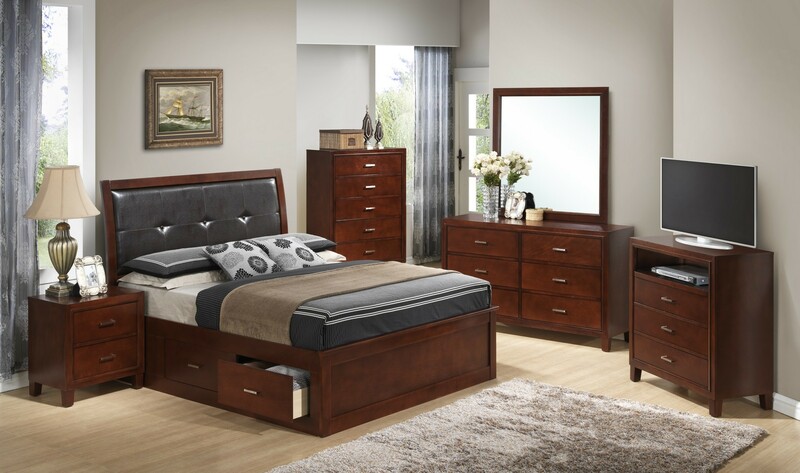 Modish Cherry Finish Bedroom Set G1200b by the well-known Glory Furniture is appropriate for a contemporary home. This modish style bed set will offer a fresh look to your bedroom. This set consists of stunning Full/King/Queen sized bed with upholstered headboard, a stylish dresser, a modern mirror, a updated Plasma chest and a chic nightstand. The entire set is made from finest quality solid wood. The set has a high gloss lustrous cherry brown color finish. The leather of the headboard is black. The nightstand has two drawers for storing undersized items, but the dresser offers plenty storage space for clothing items and also linens, etc. in its six spacious drawers. The stylish and sleek mirror adds to the elegance of the bedroom set. Mirror with square shaped frame looks sleek. The chest also has five drawers. The drawers are spacious enough to store plenty of your household items.